So when did Mario get his start as an athlete? Mario Kart perhaps, since that game established the effectiveness of the Mario spin-offs? Or was it NES Open Tournament Golf, since that was Mario's first starring role in a sports title? Or could it even be plain ol' NES Golf, even though Mario looked more like some golf-playing uncle who just happened to be named "Mario" rather than the mustached wonder himself? None of these is the true origin of Mario sports, actually. In keeping up with my fascination with obscure bits of Mario trivia, I thought I'd mention this: the nearly forgotten Game & Watch title Donkey Kong Hockey. There's not much information available about this 1984 game online. Its Wikipedia entry is basically limited to stating it exists and noting that "Critics claim that if Nintendo put the same amount of work into the game as they did on the design, the game would have been better." 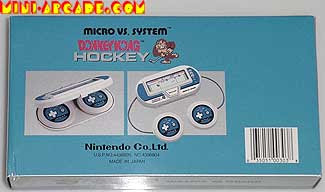 Donkey Kong Hockey had a wider screen that most Game & Watch releases. It also featured two control pads, so players could go head-to-head, with one playing as D.K. and the other playing as Mario. What interests me especially about this title is that hockey is the one sport that Mario and crew have not yet returned to. With tennis, golf, baseball, basketball and soccer being done to death, could this be the next event Mario turns to? Perhaps not, if the game was as unpopular as some negative reviews imply. But of all sports to pick, why on earth did Nintendo pick hockey to be Mario's sports debut? For more information on this and other Game & Watch titles, check out Andy Cole's page, which offers a great collection accessible through a top-notch interface.